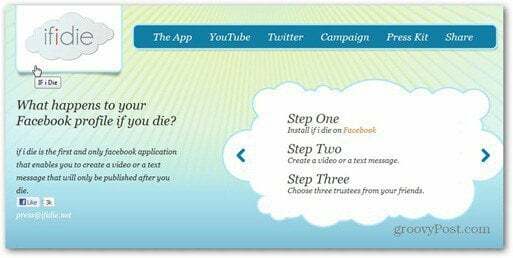 An interesting new Facebook app called ifidie that publishes video or text messages after the inevitable comes. Of course, you won’t be able to allow its posting yourself (that would be something); one of your trusted friends will have to take this responsibility. 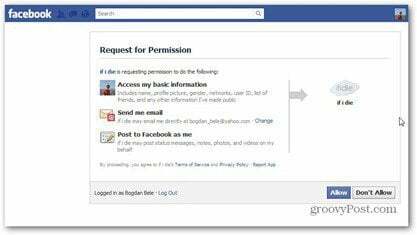 First, install the app to your Facebook account by clicking here and then allowing it to access your basic info, post to Facebook as you and send you e-mail. Then, choose between leaving a video or a text message – obviously, you need a webcam for the first option (you can also upload a previously recorded video file). After you’ve written your message, choose the people you trust to post it when you pass on. At least three trustees must report you for the message to be published (this takes out a part of the risk of idiotic practical jokes). Also, once the system receives a notification from one of the trustees, it starts investigating further. Then, click Deposit your Message. Or cancel it, if you’re not sure. You’ll see a preview of your message and you can access it and delete it at all times, or post a new one. Is this some creepy Monday stuff or what?